Displaying the current state of your finishing line in the glance of a screen? Yes, please! Tracking recipes, identifying parts, performing automatic color changes, adjusting thickness and the numerous finishing line parameters at the push of a button? A must-have! It’s all available with Super-Vision by Superfici. Tracking parts has never been easier, especially with a customer-chosen RFID or barcode system that communicates with their warehouse and shipping department. SuperVision, acting just as a traffic light would, oversees all areas of your finishing line. From recalling the recipes that are programmed on individual machine PLCs, to stopping and starting the line when gaps are needed. 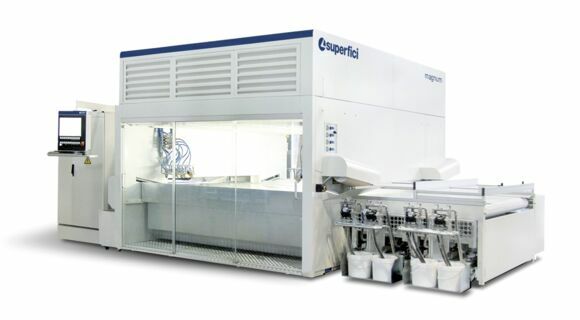 Spraying in full automated lines is, as an example, easily managed by our Magnum, the premier machine among the Superfici spraying machines, guarantees the highest quality level combined with high capacity. The machine features multiple reclaiming units to execute product/color changes without any machine stoppage required, as well as reclaiming of the different materials used. Automatic color change or lacquer mixing systems are also easily integrated and controlled by the machine software; the requested color can then be even centrally selected on the line control interface, thus managing all necessary operations to start with the new color. The Filter on Demand system, available as an option on the spraying machine, automatically changes the air exhaust filter, after a preset production volume has been produced. This improves ventilation quality and constancy inside the cabin while keeping the machine constantly operating. The drying process reaches the highest flexibility by using different dryer types, that can be modulated in their drying parameters according to the required drying cycle. The central line recipe selects what needed to process the different jobs. The line can be engineered to perform the most varied drying cycles, combining for example vertical dryers, flat dryers and UV curing systems. Sanding machines are also perfectly integrated in the whole process. There might be wide belt sanders, brush sanders or special edge sanding units in the line; all of them are centrally controlled so that the right local machine program is activated to execute the right sanding cycle. 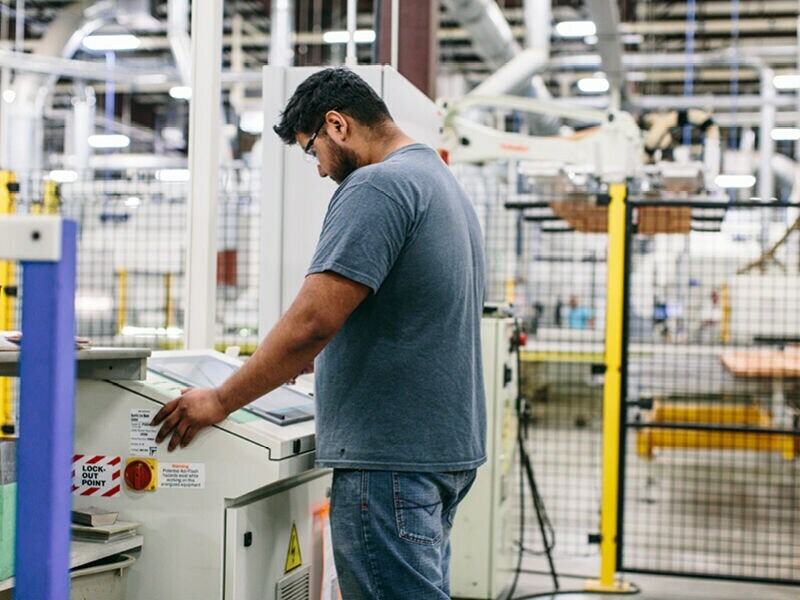 Adding to the SuperVision automated finishing technology, to complete a truly state-of-the-art line, automatic material handling is a must-have. Cross transferring, panel tilting and loading/unloading of the pieces is all automatically managed by the line recipe. Handling robotics deserves specific highlight; from loading and unloading, to sorting based on color, material, SKU and more, these material handling robots save companies and employees hundreds of hours a year! 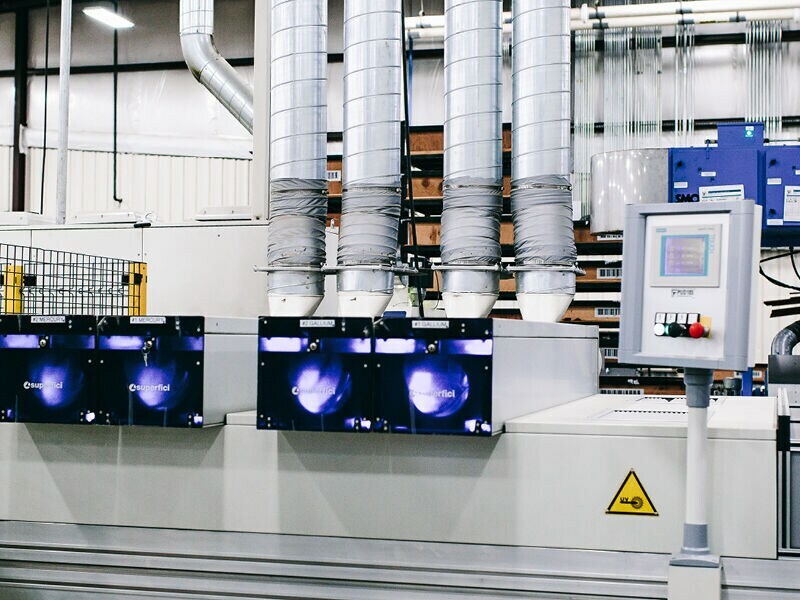 With automated integrated finishing controls, high color visual screens and easy-to-use programming, the SuperVision system takes your business & success to the next level. When it’s more than a machine – SuperVision by Superfici.